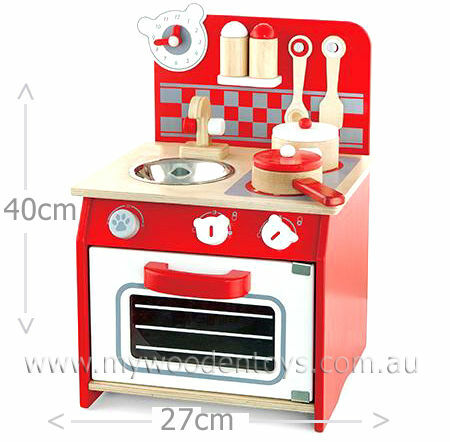 This kitchen playset stands 42cm high and has a metal bowl as a sink. The stove has an opening door with a magnet catch to hold it closed. The stoves knobs turn and make a satisfying clicking noise. The set has a back board with a clock with hands you can move a shelf with salt and pepper and two hooks with a spoon and spatula. This is a very well made toy and a wonderful compact size. Please note this toys is 42cm high x 27cm wide x 24cm depp. Material: Wood Child-safe paint, Metal bowl, magnet latch. We like this because: "Beautifully made. All you need in one compact size."